Choose from 30 hotels and guest houses in Shropshire. Shown below a just a selection of the hotels available. To search within an area please use the menu on the right. The Down Inn is located in stunning countryside just 5 minutes from Bridgnorth. A warm, friendly welcome and a tasty carvery await. The family-owned, traditional free house has open log fires, wholesome country food and local cask ales. 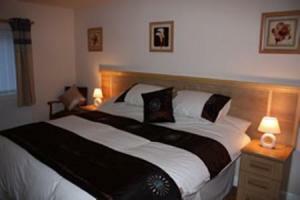 The superbly appointed en suite rooms were opened in October 2008. Some rooms have free Wi-Fi access. 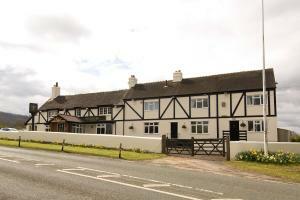 The Down Inn is surrounded by many public footpaths with lovely views of the Shropshire countryside. Enjoying a Midlands location, the hotel is ideally located for easy access to the M54 and Telford town centre. It is adjacent to Telford International Centre and the lovely town park. Telford Railway Station is half a mile away and the hotel has ample free parking. The 150 bedrooms, including a selection of superior rooms and suites are comfortably furnished and well appointed, each with an en suite bathroom. Excellent conference and meeting facilities are available all with natural daylight. A boutique Georgian hotel, Fishmore Hall overlooks Ludlow, with stunning views over the Shropshire countryside. Recently restored, the hotel boasts contemporary bedrooms with designer bathrooms. All rooms have a power shower and some have double-ended baths. Molton Brown toiletries are provided with bathrobes and slippers. Free wi-fi internet access is available, along with a flat-screen TV and Freeview. Dining in an elegant atmosphere may be enjoyed in the restaurant at Fishmore Hall, with views across the beautiful countryside through the large French windows. Afternoon Tea upon arrival may be arranged. Within close proximity to the hotel are activities ranging from golf to fishing and horse riding. Fishmore Hall is just 1 mile from Ludlow, famous for its food festival, restaurants, shops and historic castle. This 17th-century inn sits under the Wenlock Edge and has views across the valley. Fresh, local produce and Real Ales are available. The Plume of Feathers has 8 en suite rooms with free internet access and tea/coffee facilities. The inn has recently been refurbished and has a heated patio and a garden area that are often used for outdoor dining. 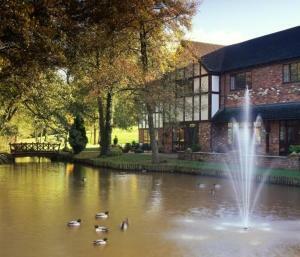 Located 5 miles (8 km) from Telford town centre, this Premier Inn is a good base for visiting Ironbridge and Hoo Farm. It has free parking and an on-site Table Table restaurant. Telford North Premier Inn is one of the smaller hotels but still offers everything you expect from Premier Inn, including incredibly comfy beds. Some rooms at Premier Inn can take 2 adults and up to 2 children (under 16 years). The 2 children also get a free full breakfast when accompanied by an adult eating a full breakfast. The full all-you-can-eat breakfast has the expected cooked items, including vegetarian sausages, as well as a wide continental selection. 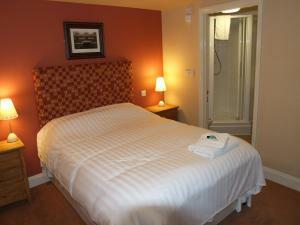 Days Inn Hotel Telford Ironbridge offers modern, comfortable, stylish bedrooms off the M6 and M54 motorways. Birmingham, the NEC, NIA and Birmingham Airport are a 30-minute drive away. The hotel is part of the Welcome Break Service Area, where there are places to eat and a 24-hour retail area. It is ideal for exploring Ironbridge Gorge and Telford town centre. Nearby towns include Cannock, Tamworth, Wasall and Wolverhampton The hotel offers a warm, friendly welcome and features in the AA Pet-Friendly Hotel Guide. All rooms feature an en suite bath and shower, telephone and modem line, a Hypnos bed and free hot-drinks tray. Park Inn Telford is ideal for Telford's government offices and surrounding business parks, whilst also well placed for Ironbridge and its 9 museums. The Park Inn Telford is ideally located in the heart of Shropshire and just off the M54 (junction 5). Park Inn is close to the Midlands and the M6, with a prime location for Telford Train Station. Leisure guests can make full use of the Innaction leisure club. Relax in the heated indoor swimming pool, sauna and steam room. Ironbridge Gorge is minutes away and residents at Park Inn Telford can enjoy free entry to Telford Town Park's 'Wonderland'. 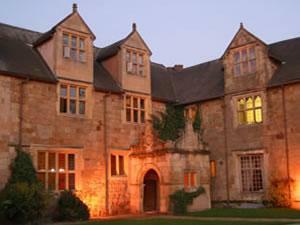 The Albright Hussey Manor Hotel and Restaurant is a 16th century, privately- run, moated manor house. Here you can enjoy four poster rooms, spa baths and award winning food. This Grade II-listed country house has a reputation for excellence in its accommodation, cuisine and faultless service. Standing in 4 acres of landscaped gardens in the beautiful, open Shropshire countryside, Albright Hussey is ideally situated just on the outskirts of the historic town of Shrewsbury. Steeped in history, this attractive 16th-century country house is now a premier Shropshire country-house hotel. 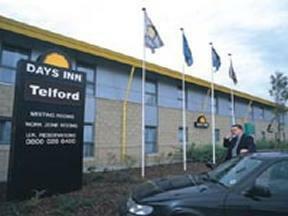 The hotel is within easy access of junction 4 of the M54 motorway, less than 5 minutes from the centre of Telford. Ironbridge, the Gorge Museum, Blist Hill and Cosford Air Museum are close by Enjoy the peaceful experience of the Madeley Court Hotel, known for its superb service and cuisine. There is a relaxing conservatory area with stylish furnishings and a lakeside view. All rooms have en suite bathrooms and 24-hour room service. With meandering corridors, high ceilings and roaring log fires, this attractive hotel is home to 3 golf courses and the award-winning attraction: Hawstone Park Follies. With an atmospheric charm, the hotel has parts dating back to the 18th century, and offers 2 restaurants, cosy bars, a croquet lawn and a professionalism that is second to none. Hawkstone Park has a reputation for fine food. Good, wholesome, traditional food and lots of it is the order of the day in both restaurants. The Terrace Bar & Restaurant, situated in the Golf Centre, commands panoramic views of Hawkstone's two 18-hole golf courses and the Follies Park beyond. With 101 spacious, modern and well-appointed rooms available at great-value rates, this contemporary hotel is situated in a convenient location, just 2 minutes' drive from junction 4 of the M54 motorway. The M54 links the M6 and the M5 with the rest of the UK. The hotel's close proximity to the M54 means it offers easy access to the region's major road network. Birmingham is just 28 miles (45 km) away and the Ironbridge Gorge World Heritage Site is also nearby. Free on-site parking is available for guests' use. The heart of town and the Telford Central railway station are less than one mile (1.6 km) away. Telford shopping centre and Wonderland are within walking distance. The hotel is fully air-conditioned throughout, with independent controls in each room. Broadband wireless internet access is available throughout. Part of the Southwater Event Group, the hotel has fantastic facilities. There 2 on-site restaurants and 3 bars. Whether you are exploring the region as a tourist, visiting on business or attending a conference, the clean, smart and comfortable rooms provide a relaxing haven. This luxurious B&B has a licensed bar, restaurant, outdoor swimming pool, covered 7-seat jacuzzi, spacious en suite rooms and all the expected amenities. Hartfield Guest House is located in the heart of Telford, less than 2 miles (3.2 km) from the International Centre and with easy access to the M54. There is free Wi-Fi internet throughout the guest house, and a locally sourced breakfast is included in the room rate. The Victorian property is set in 2 acres of grounds, with electric gates for added security for the ample parking. Just off the A5, on the outskirts of Shrewsbury, this air-conditioned hotel features large, modern bedrooms, a contemporary restaurant and conference facilities. Bedrooms at Blueberry Hotel Shrewsbury feature luxury power showers, super-king beds and Wi-Fi (at an additional cost). Blockbuster films and Sky TV should ensure an enjoyable stay. The modern, relaxed restaurant serves breakfast and light lunches, and is next to the casual bar with a plasma-screen TV showing Sky Sports and Sky News. This fine English country house hotel (AA 85% Merit) is ideally located a short level walk from the market town of Ludlow, and offers an excellent standard of service, fine dining and outstanding accommodation. Looking out over stunning Shropshire countryside, the family-run accommodation rated by the AA (Outstanding, 85% Merit) boasts magnificent views and impeccable service. With 2 AA Red Rosettes and Michelin-listed cuisine, it is one of the most awarded hotels in South Shropshire. The talented kitchen team continue to amaze with menus of divine flavour, colour, delicacy and imagination. Over recent times, the rooms and bathrooms have undergone complete refurbishment and upgrades to provide luxurious, contemporary accommodation. The Prince Rupert Classic Hotel is in the heart of Shrewsbury, surrounded by narrow streets and timbered buildings and a short walk from the towns many historic attractions. Once the home of Prince Rupert, the grandson of King James I, the hotel is widely recognised as the town's finest, and dates back to the 12th Century. 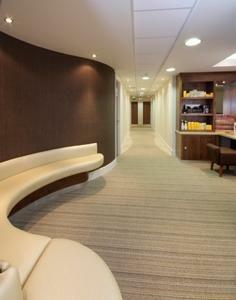 Guests have a choice of restaurants and use of the Health Suite including a beauty salon. The perfect base to explore this historic town. A member of Classic British Hotels. This deluxe 4-star contemporary hotel has recently undergone a GBP 7 million renovation, with every facet of the hotel having been totally transformed. With superb facilities in an enviable setting overlooking the Ironbridge Gorge - a UNESCO World Heritage Site, The Telford Golf & Spa Hotel - A QHotel offers the ideal location for an enjoyable break. Completed at the beginning of December 2007, the extensive renovation has totally transformed this hotel into a quality modern establishment. The hotel offers every modern comfort including its own 18-hole championship golf course and well-equipped gym. Situated within its own grounds, it is a great get away from it all location, yet situated within a 5-minute drive of the centre of Telford. Macdonald Hill Valley is perfect for golf, leisure and spa breaks. It has two 18-hole golf courses, a new health club, and is 20 miles (32.2 km) from Chester and Shrewsbury. The hotel is set in 300 acres of beautiful countryside one mile (1.6 km) from Whitchurch. Manchester and Birmingham international airports are about one hour away, and Crewe Railway Station is 30 minutes away. All bedrooms have modern amenities and a stylish design. Some rooms and some of the ground-floor patios have views across the Championship Emerald golf course The new Vital Health & Well Being Club and Spa has a 20-metre swimming pool, Techno gym, sauna, steam room, experience shower, beauty rooms, relaxation room and nail bar. Set in 5 acres of landscaped grounds, this new Telford hotel is within easy walking distance of the Telford Shopping Complex and the offices of Cap Gemini and Fujitsu. The 90 en suite bedroom are complemented by extensive conference facilities and a range of convenient amenities. Start the day with a full English breakfast in the Merlots Restaurant, where you can also partake of brasserie style food in the evening. A gymnasium, games room and selection of outdoor sports courts will be sure to keep you relaxed and refreshed. The attractive grounds make the ideal backdrop for weddings, conferences and other functions. Less than 7 miles (11.3 km) from Shrewsbury's town centre, the hotel offers great value, with free parking and spacious, comfortable and modern en suite rooms. The Premier Inn Shrewsbury (Harmers Hill) has a convenient location with good access to the region's major roads. Yorton Railway Station is less than 2 miles (3.2 km) away. The hotel has a 24-hour reception desk and some rooms can take 2 adults and up to 2 children (under 16 years). The 2 children also get a free full breakfast when accompanied by an adult eating a full breakfast. An all-you-can-eat buffet breakfast is available each morning and includes the expected cooked items such as scrambled, fried, poached or boiled eggs, and pork or vegetarian sausages. There is also a wide continental selection. The on-site Brewers Fayre restaurant offers traditional, great-value pub favourites in a family-friendly environment. Immersed within 8 acres of beautifully landscaped gardens, this carefully restored 16th century flour mill now provides superb 4-star accommodation in Alveley, in the heart of the glorious Shropshire countryside. With 41 luxuriously appointed, modern bedrooms and suites, each with views of the pool and gardens, The Mill still maintains many of its original features, including oak beams and the original workings of the old mill in the lounge. The Mill Hotel is ideally located for visits to numerous local attractions, including Ironbridge, West Midlands Safari Park, Severn Valley Railway and Bridgnorth Town. Amid wonderful mature gardens with tree-surrounded lake and incredible views over beautiful countryside, Swallow Buckatree Hall Hotel is located at the base of The Wrekin, the most famous Shropshire landmark. An ideal base for a relaxing break or getaway from the stresses of the working week, Buckatree Hall is only minutes from the centre of Telford, Ironbridge and Shrewsbury. Many of the hotel's 62 bedrooms have a continental influence, with doors opening onto individual balconies overlooking the lake or garden. There is no better place to sit and relax after a hard day's work with your favourite drink. The bedrooms are tastefully decorated with good-size desks and Wi-Fi access throughout the hotel and grounds. With glass walls overlooking the gardens and lake, the Terrace Restaurant is a tranquil venue to enjoy breakfast, lunch or dinner. Daily changing menus using locally sourced produce are available in the bar and restaurant. Right next to Telford Rail Station and close to the M54, A442, A5 and town centre amenities, Premier Inn Telford Central is very well located. It also has the Premier Inn features you'd expect: incredibly comfy beds in every room, free parking and an on-site Beefeater restaurant. Shops and entertainment at the town centre are within walking distance. Some rooms at Premier Inn can take 2 adults and up to 2 children (under 16 years). The 2 children also get a free full breakfast when accompanied by an adult eating a full breakfast. The full all-you-can-eat breakfast has the expected cooked items, including vegetarian sausages, as well as a wide continental selection. Set in beautiful countryside halfway between Telford and Shrewsbury, The Wroxeter Hotel has easy access from the A5 and M54. With modern and well appointed bedrooms, The Wroxeter is ideal for short breaks and getaways; walking and country pursuits; and for business travellers looking for something more than just a room. The family-run hotel excels in traditional cooking and personal service. Within walking distance is the Roman site of Viriconium and Wroxeter Vineyard. Warm, friendly, smoke free and informal; our aim at this small, family hotel is to provide a homely, tasteful environment with high standards in food and cleanliness. Sandford House Hotel is located close to the Severn with its fine riverside walks, yet is within a few minutes' walk of the town centre. Nearby are many excellent restaurants and eating houses of all kinds. Due to this we only cater for bed and breakfast. In Newport Shropshire, this family-run hotel offers Regency elegance and comfortable, charming accommodation at good-value rates, with the warmest of welcomes from your hosts, Nigel and Vanessa. Just 15 minutes away from Telford and a short walk away from the local town and the variety of amenities it offers, this newly built hotel is set just behind the Swan Inn, with idyllic scenes from the garden, overlooking the canal. All of the rooms are individually furnished and decorated and each room has its own unique character and charm. All rooms are centrally heated and equipped with en suite facilities, colour television, tea/coffee making facilities and a hair dryer. It is the careful attention to those little details that really sets this charming little hotel apart, There is also an award-winning public house and the King James II restaurant, offering an ? la carte menu featuring home-cooked food freshly prepared by your host, Nigel. The modern and comfortable Premier Inn Oswestry has free parking, family-friendly rooms and an on-site Table Table restaurant. Some rooms can take 2 adults and up to 2 children (under 16 years). The 2 children also get a free full breakfast when accompanied by an adult eating a full breakfast. The full all-you-can-eat breakfast has the expected cooked items, including vegetarian sausages, as well as a wide continental selection. This charming 17th century coaching inn is a 3-star hotel, abundant in characteristic period details. Staff offer the best in friendly, professional service at Gaskell Arms Hotel & Restaurant. The Gaskell Arms Hotel offers warm hospitality in a pleasant setting for visiting Shrewsbury, Ludlow and Church Stretton. The hotel is a family owned and managed free house open throughout the year, with the addition of a welcoming log fire to greet you in winter. There is an ? la carte menu, served in the oak-beamed restaurant. You can also enjoy an interesting selection of hot and cold food in the cosy lounge bar. In warmer times, head to the secluded walled garden where you may take your refreshments and enjoy the peaceful setting of this ancient coaching inn Guests are able to return after midnight, with entrance gained by a hotel key.